I was taking a trip down the memory lane on my blog and stumbled on the post I wrote when Smarty was two and a half about her emerging love of board games. 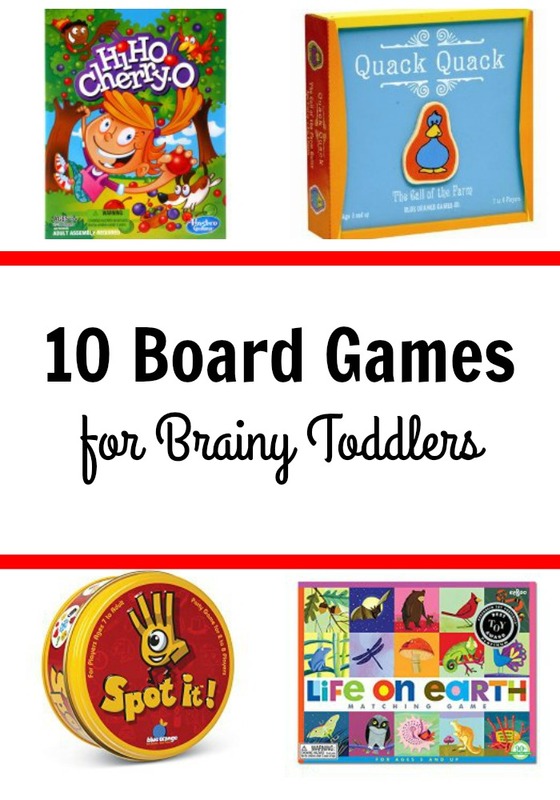 I decided to revisit the topic and reached out to my friends at Raising Poppies community asking them which board games their “brainy toddlers” like to play. Then I pulled all our favorites together into this gift guide with board games for brainy toddlers. Disclosure: I am an Amazon associate, and this post contains Amazon affiliate links. For full disclosure, please click here, and thank you for supporting my blog! Name and Link: Quack Quack. We got it as a birthday present for Smarty’s second birthday. It was her first board game. Pros: Durable wooden pieces and a wooden box, very simple rules (to match your colored animal pieces to a color die and to make an animal sound). Teaches color discrimination and good for increasing processing speed. Cons: Might be a little stressful if played with older siblings. In our games we gave Smarty 5 second “handicap” to get her thoughts and actions together and to give her a chance to "win". Name and Link: High Ho Cherry-O. Also a gift from the second birthday, introduced about 2 months later. Smarty took to it right away and loved playing it. Pros: Teaches counting and one to one correspondence. Can support up to 4 players. Reasonably short for short attention span. Cons: Small pieces are very tempting for use outside the game and can easily get lost. They are also a choking hazard for younger siblings. In addition, Smarty really didn’t like “spill the basket” action when she would have to return all her fruits to the tree. We modified the rules to return only 2 pieces to avoid arguing about it. Name and Link: Life on Earth . We had a different memory game, but they are all basically the same (and you can make your own). Pros: This version has beautiful images that can be used for discussions and animal study. Strengthens working memory and visual discrimination. Cons: Smarty never enjoyed memory games, so we only played our memory game very infrequently. 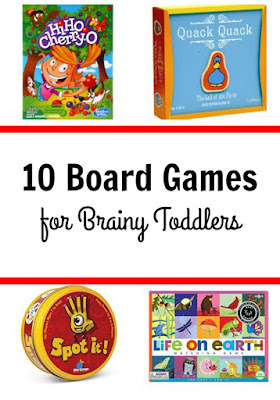 Many other parents of brainy toddlers said that their children do enjoy these games. I suspect they are more interesting if played with siblings. Name and Link: Spot It. We got it when Smarty left her toddlerhood years, but my friends at Raising Poppies say that their 2 and 3 year olds are enjoying it. Pros: Easy to play and can be played in teams. Promotes visual discrimination and spatial skills as objects are often rotated differently. Cons: An original version might be too difficult for a toddler even though our friend’s kid who was 3 at the time could play it with a bit of help from his Mom. If I still had a toddler, I’d probably opt for Spot It Jr. version. Pros: Easy to play, very simple game mechanics, cooperative game, perfect for kids who cannot lose. Cons: Smarty loved the game, but I found it deathly boring. It’s probably better for sibling play. Pros: Color and number recognition, can be shortened to match attention spans. Here is one great modification of Uno for younger kids. Cons: Little kids cannot hold cards in hand, but at home my husband made a screen, so Smarty could arrange her cards behind it. Also, it’s quite likely that your young players will be fiddling, bending, and maybe even chewing on Uno cards. Pros: Classic game that everyone knows. Teaches turn taking, color recognition, and counting. Cons: The reason why we didn’t get it was because cards, die, and moving pieces seemed like too much for a young age, and later we had more interesting board games. Pros: Action-filled fun for entire family. Cons: It’s best with several (4) players, and we usually had only 2 players available. Smarty did enjoy playing this game visiting her friends with siblings. Pros: Specifically designed for very young players, cooperative game with big sturdy wooden pieces. Cons: It’s expensive, so it would make most sense for large families and/or daycare providers. Pros: Strengthens fine motor skills and hand-eye coordination, reinforces color matching. Easy to play and specifically designed for young kids. Cons: You can achieve pretty much the same game mechanics and have even more fun with real acorns and tweezers. Less plastic to lie around or recycle when your children grow up. Do your 2 and 3 year olds enjoy board games? Which ones? Follow my Pinterest board Gift Ideas. I found a 2 player game of Hungry Hungry Hippo in a garage sale one time.